Do you need more vitamin C in your diet? You may want to try the sweet and sour taste of Terminalia ferdinandiana, better known as kakadu plum or gubinge. This olive-sized fruit is said to have 100 times more vitamin C than the regular orange. Potential kakadu plum benefits vary from boosting the immune system to possibly battling cancer and Alzheimer’s disease. We will closely examine the super fruit and learn more about kakadu plum nutrition facts. Native to Australia, the kakadu plum is documented to have the highest concentration of vitamin C of any other plant life. It has been used for health, medicine, and even cosmetics. This superfood is thought to slow the aging process as well. The Australian Government Rural Industries Research and Development Corporation has conducted studies and research over the years to protect the harvesting of this precious crop. According to the above table, 100 grams of this fruit has nearly 3,000 milligrams of vitamin C—50 times more than found in a single orange and almost 5,000% of your recommended daily value. Vitamin C is essential for maintaining the health of our body’s tissues and keeping our bones, teeth, and gums strong. The kakadu plum’s folate content per 100g is comparable to that of broccoli and it has 5.2 more antioxidant power than a blueberry. The antibacterial, antifungal, and antiviral properties of the kakadu plum make the fruit highly favored among nutritionists. Harvested through the months of March to June, the kakadu plum is a tart-tasting fruit with a hard-inner seed. The tree of the fruit is used for medicinal purposes as the bark is directly applied to burns and infections while the sap is used for joint inflammation. Our immune system can quickly become vulnerable to infection and disease when it is at a stage of low functioning. Those with vitamin C deficiency often show the reduced ability to fight off infections. Consuming rich sources of vitamin C, such as the kakadu plum, may enhance the immune system as well as reduce the risk of developing chronic conditions like gallbladder disease and high blood pressure. Vitamin C is also a powerful antioxidant, and the kakadu plum contains amounts that surpass that of most foods found in the world today. Antioxidants are known to protect the body from damage caused by free radical molecules, which has been linked to the development of cancer and other conditions. Experts also theorize that aging is the result of free radical damage collected by cells over time; however, a growing number of studies have challenged this theory. Due to its high vitamin C content, kakadu plum is also used in cosmetic products. The vitamin aids in the production of the amino acid proline, which is responsible for collagen production. Studies have shown this antioxidant reduces wrinkles and other signs of aging with continual use. The Beeson Aesthetic Surgery Institute in Indiana completed a three-month study, during which volunteers saw improvements in photodamaged facial skin with daily use. In addition to vitamin C, the kakadu plum contains skin benefits of vitamin E, iron, zinc, folate, and lutein. The kakadu plum is a good source of dietary fiber. Half a cup provides you with about 7.1 grams of the 25 to 30 grams recommended daily for adults. Fiber keeps your digestive system running smoothly by enlarging your stools, which helps them pass through the intestines more easily. This makes it beneficial to those suffering from constipation or loose, watery stools caused by diarrhea. With research showing the benefits of a vitamin C-enriched diet in maintaining good heart health, the kakadu plum should be the first fruit you reach for. While it may not alone prevent a heart attack or lower cholesterol levels, vitamin C has been shown to protect the arteries. 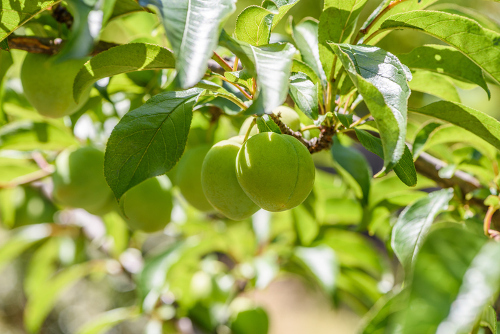 Studies have shown a reduction in the progression of the hardening of the arteries with a balanced diet, concluding high levels of vitamin C.
Kakadu plum has been used in various forms by local Australians for more than 40,000 years. One Kimberly resident and businesswoman, Pat Torres, told Australia’s ABC News Online her family has harvested of the fruit for generations. “If you eat it as a fresh fruit, it has a sweet and sour sort of taste, and if you cook it, it’s like eating pears and apples cooked up,” she said. Torres manages a cooperative that supplies the fruit to restaurants and health food stores. The kakadu plum can be consumed off the tree, freeze-dried for powder uses, and added to cereals and salads. We have found a popular and tasty recipe for you to enjoy the benefits of this amazing super fruit. Using a covered bowl or mason jar, place the banana, chia seeds, kakadu plum, oats, and protein in layers. Add almond milk and place covered dish in refrigerator. Turn dish upside after one half an hour and leave in refrigerator overnight. In the morning, stir dish and enjoy! Used for centuries by Australian aboriginals, the kakadu plum has health benefits outweighing most fruit plants. This small fruit is one of the richest vitamin C sources with more than 100 times the antioxidant than oranges and more potent than blueberries. With all of the health benefits and nutrition uses of the kakadu plum, it may be a wonderful addition to your diet. “Kakadu Plum,” Fruits Info; http://www.fruitsinfo.com/kakadu-plum.php#Commercial-Applications, last accessed February 22, 2017. “Vitamin C,” University of Maryland Medical Center; http://umm.edu/health/medical/altmed/supplement/vitamin-c-ascorbic-acid, last accessed February 22, 2017. Martin, L.,“Gubinge: Kakadu plum ‘superfood’ Set to Lead Expansion of Kimberley Bush Fruit Industry,” ABC Australia, May 18, 2015; http://www.abc.net.au/news/2015-05-19/gubinge-industry-set-to-take-off/6480204, last accessed February 22, 2017. “Kakadu Plum,” The Australian Superfood Company, March 3, 2015; http://austsuperfoods.com.au/superfoods/kakadu-plum/, last accessed February 22, 2017. Axe, J.,“Kakadu Plum: 5 Benefits of the Most Vitamin C-Rich Fruit on the Planet,” Dr. Axe; https://draxe.com/kakadu-plum/, last accessed February 22, 2017.